The interview with Dr Sammy Noumbissi was published in the 1st issue of the magazine ceramic implants. Dr Sammy Noumbissi has been practicing implantology for many years, specialising mainly on the use of ceramic implants. In 2011, Dr Noumbissi founded the International Academy of Ceramic Implantology (IAOCI), an organisation dedicated exclusively to ceramic and metal-free alternatives to metal implants. 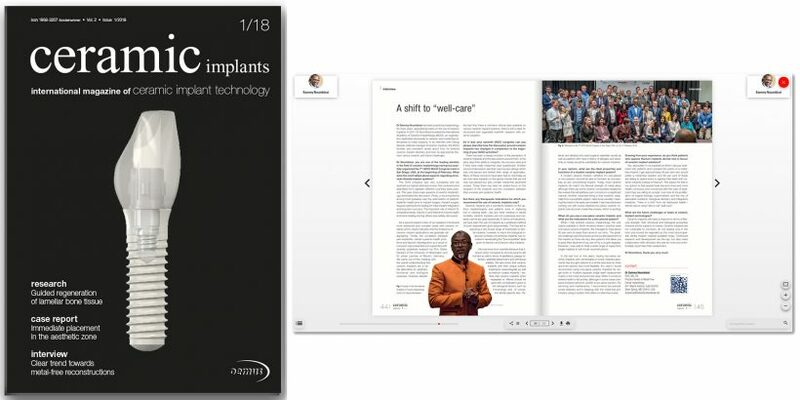 In an interview with Georg Isbaner, editorial manager of ceramic implants, the IAOCI founder and president spoke about how he entered ceramic implant dentistry and how he approaches titanium versus ceramic and future challenges. Read the full interview in the ePaper.